We’d love your help. Let us know what’s wrong with this preview of The Azrael Initiative by K. Hanson. Best friends Kayla Falk, an engineering student, and Olivia Bellamy, who is studying nursing, are nearing the end of their college career when terrorists attack their university. Through a combination of cleverness, bravery, and luck, the two manage to foil the deadly plot. A mysterious man from the United States government, Mr. Hightower, sees their potential and attempts Best friends Kayla Falk, an engineering student, and Olivia Bellamy, who is studying nursing, are nearing the end of their college career when terrorists attack their university. Through a combination of cleverness, bravery, and luck, the two manage to foil the deadly plot. A mysterious man from the United States government, Mr. Hightower, sees their potential and attempts to recruit Kayla and Olivia for a program to take on ISIS. They initially refuse, but another terrorist attack that strikes close to home pushes them to change their minds and join the Azrael Initiative. To ask other readers questions about The Azrael Initiative, please sign up. The Azrael Initiative was sent to me for free in exchange for an honest review. As always, all thoughts and opinions are my own. This isn’t the type of book that I would normally pick up but when author approached me about reviewing an advanced copy, I couldn’t say no. The premise is great – two badass females who take on ISIS after an attack on their college. I devoured it and I can honestly say that I can’t wait for the sequel… and this book isn’t even released yet. - The dialogue between the characters was a little too formal and struggled to flow naturally. - I don’t think it’s very realistic that the main characters could become fluent in Arabic / become highly skilled operatives over the course of just a few months. I thought this was a good story, although written in a somewhat simplistic style. I'm sure the situations Kayla and Olivia found themselves in should have been far more violent and problematic. Everything was just a bit too easy for our female protagonists. If it hadn't been for the subject matter I would have thought this book was more intended for a Young Adult audience (no slight intended as there are some excellent YA books out there). I also thought the dialogue was slightly clumsy and struggled to flow naturally. Reviewers Note: "I chose to read this book and all opinions in this review are my own and completely unbiased." The Azrael Initiative isn't my usual read. I like a bit of fantasy YA and a bit of contemporary YA, but this book falls somewhere in between. It's certainly not fantasy, but it's not exactly contemporary either. Even so, I ended up really enjoying it. The writing style and overly simplistic plot weren't to my tastes (more on that below!) but I loved the strong friendship between Kayla and Olivia that was at the heart of this novel. After a bit of a slow start, the story gets its hooks into you. The Azrael Initiative isn't my usual read. I like a bit of fantasy YA and a bit of contemporary YA, but this book falls somewhere in between. It's certainly not fantasy, but it's not exactly contemporary either. Even so, I ended up really enjoying it. The writing style and overly simplistic plot weren't to my tastes (more on that below!) but I loved the strong friendship between Kayla and Olivia that was at the heart of this novel. After a bit of a slow start, the story gets its hooks into you. There are some sections (no spoilers here!) that really hit hard. Both girls are well written and their friendship was the bedrock of the story. Families don't get enough of a look in in a lot of YA books, so the girls' close bond with their families and each others was touching. The book also correctly (imo) posits that family isn't always blood and real family is the people you choose to surround yourself with. The author deserves kudos for having the nerve to tackle such a thorny subject. It would have been easier to set the book in an alternate world or create a fictional enemy but he didn't take the easy road and I do admire that. However this caused a bit of an issue for me. Kayla and Olivia are basically recruited as child soliders and trained/brainwashed to blindly attack the enemy they're pointed at. Kind of like ISIS then? The problem is, they're guilty of exactly the same thing they're trying to prevent. Their own overseer outright states that "our agents will work to instill fear in ISIS using any means necessary." So, become terrorsits themselves? Kayla deals with terrorists killing her family by going out and killing terrorists, who presumably have families of their own. It's all very black and white, but this story really would have benefited from some shades of grey. One particular scene in which Kayla brutally stabs a suspected terrorist to death before remarking that people "like him" remind her of the people that killed her family, while straddling his still warm corpse, is staggeringly tone deaf. 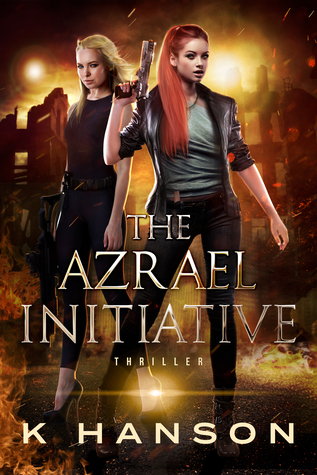 The Azrael Initiative is a strong contender in the YA adventure field, picking two teens out of utterly normal lives and catapulting them into extraordinary circumstances. I found that the storyline was well-constructed, with enough breadcrumbs leading to the twist to make it plausible, but not enough to be a dead giveaway. However (without dropping a ton of spoilers) there were some elements that made suspending my disbelief tricky as I read, not least that neither of our two heroines apparently asked any more questions than ‘where do I sign?’ before involving themselves once the pivotal tragedy had struck. The convenient villain’s diary that gives away the whole background was another. On the whole, though, this was an entertaining, well-paced read, and the absence of useless females was a refreshing change. Two college students Kayla Falk and Olivia Bellamy are just enjoying life and their last of year of college just waiting for graduation when they can start their new careers and lives. But before they graduate their school is attacked by terrorist. Kayla and Olivia single handily take the terrorist down. Afterwards they are approached by a man from the government a Mr. Hightower trying to recruit them to work for him to help take down Isis or at least some of their people but Kayla and Olivia tu Two college students Kayla Falk and Olivia Bellamy are just enjoying life and their last of year of college just waiting for graduation when they can start their new careers and lives. But before they graduate their school is attacked by terrorist. Kayla and Olivia single handily take the terrorist down. Afterwards they are approached by a man from the government a Mr. Hightower trying to recruit them to work for him to help take down Isis or at least some of their people but Kayla and Olivia turn him down fighting terrorist is not for them. But when they strike again Kayla and Olivia decide to take Mr. Hightower up on his offer. So after long and hard work Kayla and Olivia are trained to fight Isis and go deep undercover in Al-Raqqah, the capital of ISIS, in Syria. Kayla and Olivia single handily kill lots of Isis soldiers on patrol around the city; take out lots of their facilities and free captives. They both know if they are ever caught and their identity’s as women are discovered they will surfer badly before death. I was graciously contacted by the author, K. Hanson, to receive a copy of “The Azrael Initiative” in exchange for an honest review. That being said, it has not altered my opinion of the book whatsoever. “The Azrael Initiative” will be published on March 3rd 2017 and available for purchase here. There are times where I personally think it’s better when I’m contacted by authors to review a book, rather than be left with my own indecisiveness and try to pick my next read. It usually works out perfec I was graciously contacted by the author, K. Hanson, to receive a copy of “The Azrael Initiative” in exchange for an honest review. That being said, it has not altered my opinion of the book whatsoever. “The Azrael Initiative” will be published on March 3rd 2017 and available for purchase here. There are times where I personally think it’s better when I’m contacted by authors to review a book, rather than be left with my own indecisiveness and try to pick my next read. It usually works out perfectly, where I’m able to jump from genre to genre, and not be bored. So coming off my latest read which was romance, I jumped at the opportunity to be able to review K. Hanson’s debut novel. Even though senior design projects and graduation is looming, the two friends still find time to get together for lunch dates. Unfortunately fate always enjoys throwing a wrench in things. While at lunch, the university befalls a terrorist attack. Adrenaline kicking in, Kayla is able to outsmart and take down the infiltrators. Who is the third party recruiter? What tragedy pushes the girls to become special ops? What is the secret mission to exact revenge? How will two women be able to survive a male dominated area? If you absolutely love thrillers, you’ll want to pick up “The Azrael Initiative” and add it to your TBR list. I enjoy thrillers. I enjoy it to the point where if I have to put the book down, I don’t consider it a true thriller. I had an extremely hard time putting this book down- purely only out of obligation due to work was about the only time I stopped reading. At the same time, there were a few instances that I thought the book was predictable, as well as unnecessary “plot twists” happening. A true thriller will keep you on the edge of your seat regardless if you are adding the Hollywood “WOW” to it. Needless to say, even with the unnecessary turn of events, I still enjoyed “The Azrael Initiative”. K. Hanson- thank you so much for allowing me to review your debut novel. I do hope you continue on with “The Azrael Initiative” as I cannot get enough of Kayla. Good luck on any future projects, and I sincerely hope to work with you again! I won this book on Goodreads! The Azreal Initiative was overall a good book. It had an interesting storyline that moved at a good pace. The characters were interesting and likeable. I found it to be an enjoyable, quick read. This was an interesting take on the fight against ISIS. Two pretty kickass lady friends versus evil. First, many thanks to K Hanson, who provided a free copy of The Azrael Initiative in exchange for an honest review. Kayla and Olivia are typical college students majoring in engineering and nursing. When they are caught in the middle of a terrorist attack on their university, they surprise themselves with their survival instincts. Their actions catch the attention of an Agent Hightower. He recruits them both to go deep undercover in a Middle Eastern city that has become an Isis stronghold. With s First, many thanks to K Hanson, who provided a free copy of The Azrael Initiative in exchange for an honest review. Kayla and Olivia are typical college students majoring in engineering and nursing. When they are caught in the middle of a terrorist attack on their university, they surprise themselves with their survival instincts. Their actions catch the attention of an Agent Hightower. He recruits them both to go deep undercover in a Middle Eastern city that has become an Isis stronghold. With specialized training, the girls strike at the heart of the heart of the terrorist organization, assassinating leaders and freeing prisoners, all at their own risk. Kayla is fueled by her rage, swearing revenge on Isis for her personal losses. Olivia is her grounding force, and tries to be the voice of reason. Her cool logic is a nice contrast to Kayla’s fury. More than once I found myself laughing as the two girls outfoxed Isis. After stories spent years trapped inside K Hanson's head, they finally broke free last year. K decided to write his first novel, The Azrael Initiative, in early 2016. He devoured several books on the process of writing a novel, then hammered out the rough draft over the course of a couple of months. After a few rounds of editing, it released in spring 2017. Now, he is working on finishing Storm Rav After stories spent years trapped inside K Hanson's head, they finally broke free last year. K decided to write his first novel, The Azrael Initiative, in early 2016. He devoured several books on the process of writing a novel, then hammered out the rough draft over the course of a couple of months. After a few rounds of editing, it released in spring 2017. Now, he is working on finishing Storm Raven, the first in a fantasy series, which will come out on December 15th, 2017. K's thriller series is inspired by authors such as Tom Clancy, whose works educated as well as entertained. Storm Raven draws inspiration from several fantasy works, including Sarah Maas's Throne of Glass series and Sebastien de Castell's Greatcoats series.